A woman in Guinea who sold herbs and potions to sterile women, telling them they would become pregnant, has been jailed for five years. N'na Fanta Camara made concoctions that made their bellies swell. The traditional healer is said to have tricked more than 700 women, charging them large sums for the treatment. The BBC's Alhassan Sillah in the capital, Conakry, says her victims at the court were upset she did not get a harsher sentence. The use of traditional medicine is common in Guinea and other parts of Africa. Camara, who was found guilty of fraud and impersonating a doctor by giving the women harmful substances and endangering their lives, was also ordered to pay $165,000 (£116,000) in compensation. Two other accomplices were convicted of similar charges, and were sentenced to three years and four years in prison. One victim told the BBC: "She gave us some medicines of leaves and herbs that made us vomit. She assured us that this was good for us. "On a second visit, she gave us some more herbs and leaves which we boiled and drank. As one continued to take the medicines, the stomach started to rise a bit. 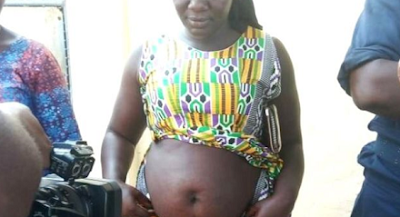 "After a while, we visited again, she examined us by just touching our bellies and she declared us pregnant. However she gives us strict instructions not to go to the hospital. "We experienced our normal menstrual cycle during this period. On the day she declared any woman pregnant, she had to give her fabric and a hen, after the initial payment." For her services, the women - aged between 17 and 45 - paid $33 (£24) in a country where the average monthly wage is around $48. Some of the women reported looking pregnant for between 12 and 18 months. Police believe Ms Camara made thousands of dollars a month. The victims' lawyer, Seny Kamano, said Camara had received the maximum possible sentence, but said the level of compensation was "insufficient" for the more than 700 women affected. A police doctor, who had examined 47 of the affected women, said at the time that they risked long-term complications from the treatment.